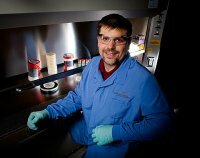 Congratulations to Dr. Matthew Marshall, a microbiologist at Pacific Northwest National Laboratory, who has been selected to receive an Early Career Research Program award from the Department of Energy's Office of Science. Marshall's proposal "Multi-System Analysis of Microbial Biofilms" will be funded at a total of $2.5 million over 5 years. In this project, Marshall will study microbial biofilms, which are large communities of bacteria growing on other surfaces. Learning more about the chemical composition of microbial biofilms could also improve understanding of how contaminants are transported underground. His research is funded by DOE's Office of Biological and Environmental Research. The DOE program provides funding for projects based on proposals submitted by researchers. Sixty-five recipients were selected from the approximately 1,150 submissions received. The program supports the development of individual research programs of outstanding scientists early in their careers and provides incentive for scientists to focus on mission research areas that are a high priority for DOE, such as biology, computing, energy, and physics. Marshall joined PNNL in 2003 as a post-doctoral research associate, and he became a senior research scientist in 2006. His research focuses on characterizing the biogeochemical interactions of biofilms in their nearest-to-native, hydrated state using high-resolution imaging techniques developed at the Environmental Molecular Sciences Laboratory (EMSL) coupled with synchrotron X-ray-based analyses to obtain spatially resolved, chemical information.